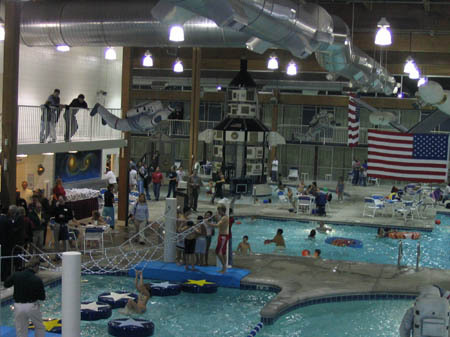 At 28,000 square feet this is the country's largest space-themed waterpark. Who else has a space-themed waterpark? Good question. From astronaut figures and hanging spaceships guests can explore the park. Play some water basketball in the activity pool. Swim laps early in the morning in the exercise pool. Experience the countdown of the Mercury rocket as it dumps hundreds of gallons of water at blast off. Fire water cannons on our kid-sized lunar lander. Moon crater themed waterfall hot tub will help you relax. And, yes, a tube slide and a body slide are also there along with the lazy river coasting around the “moon base” island or step carefully on the floating comets to avoid spilling into the pool. You do not have to be a guest of the Grand Prairie Hotel to enjoy the park. Guests can pay $8.95 each to enjoy a day at the park as long the park has available capacity. In other words, call in ahead of time or arrive early.